Black and silver number plates perfect for classic cars! What is it about classic, vintage vehicles that make them so attractive? If you stripped back a modern car to the bare basics, and drove it like you would a Ferrari 250 GT, or a Mercedes 300 SL Gullwing, it would not compare, not even close. Maybe that’s why they now come with 7+ figure price tags. You can look back on these cars knowing that the work, time and effort that went into building them was second no other era. And they wouldn’t look the same without those timeless black and silver vintage number plates. In order to keep up with ever rising demanding for new cars, manufacturers have had to adopt a different approach to building their vehicles. For a lot of companies, the use of intelligent technologies and machinery is essential to create the quantity of cars that they sell day to day. This does mean though that their products lose their authenticity and some of the cutting edge that came with designing and producing a now ‘classic’ car. These common, now old fashioned techniques still have a clear value. It shows through the vast amounts of money that is collected by companies like Bentley and Rolls Royce for the sales of their £150,000+ creations. Hand stitched leather seats and hand woven floor fabrics, Rolls Royce claim that the only element on their production line that is fully automated is the paint, purely for consistency, fair? One day, these cars will be worthy if displaying classic vintage number plates. The same goes for motorcycles, with a lot of the modern era of bikes being build on the foundations built by the bikes ridden by the likes of James Dean and Steve McQueen. Some of the coolest men in history rode motorcycles. And if you’re lucky enough to own a motorbike like this then you know that standard number plates do not do it justice. Thankfully, we have got you covered and also offer motorbike sized vintage number plates! Can I put vintage number plates on my new car? 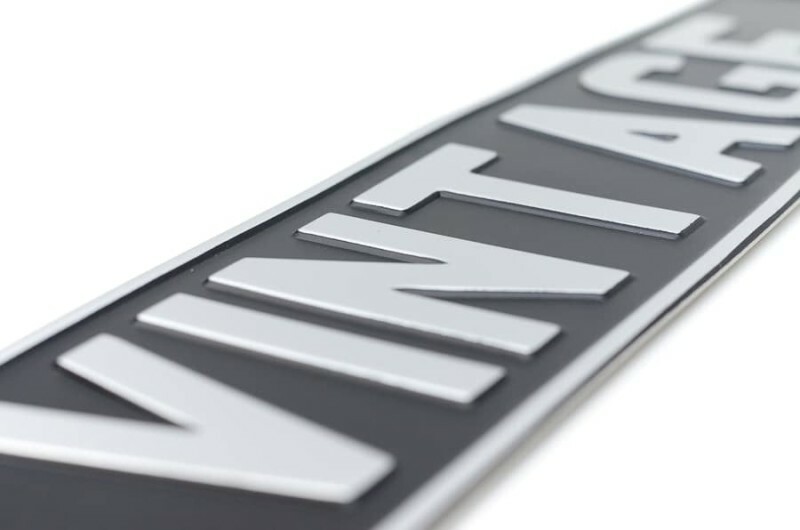 Many people come to us asking if we can provide our vintage number plates for their modern car. Unfortunately this is not legal. Vintage number plates can only be displayed on vehicles that were manufactured before 1978, but this is likely to change as it is a rolling regulation, meaning that the vehicle has to be over 40 years old from the current year to legally display the black and silver plates. You can create your own using our plate builder!